Being injured in an accident can be disconcerting and stressful. A spinal injury can result in mild to severe pain. Depending on the severity of your injury, you may experience numerous symptoms, and you are likely to incur costly medical bills. 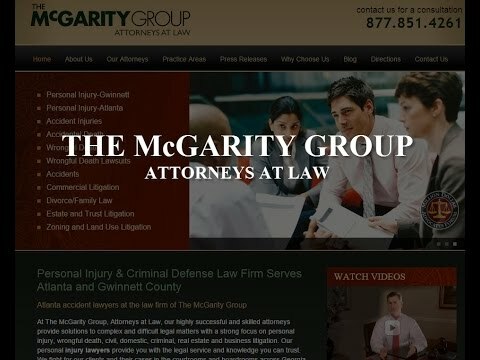 If you suspect your spinal cord injury is the result of another party’s negligence, our attorneys at McGarity and Efstration, LLC have the skills and experience to help you recover the compensation you deserve. Disc injuries. There are a variety of disc injuries that can occur, including a herniated disc, ruptured disc, bulging disc, protruding disc or torn disc. Thoracic spine injuries. The 12 vertebrae in the upper back make up the thoracic spine. The thoracic spine is designed to protect the vital organs of the heart and lungs. Cervical injuries. Cervical injuries are neck injuries. They involve the neck and the section of the spine that has seven vertebral bones, which get smaller as they get closer to the base of the skull. Lumbar injuries. Lumbar injuries involve the lower back, which experiences a lot more motion than the rest of the spine and also carries all the weight of the torso. As a result, the lower back is the most frequently injured area of the spine. Sacral and coccyx injuries. A bone called the sacrum makes up the back part of the pelvis. It connects the spine to the lower half of the body. The coccyx, otherwise known as the tailbone, is in the sacral region at the very bottom of the spine. Spinal fractures. Spinal fractures include spinal burst fractures, compression fractures, flexion-distraction fractures and fracture-dislocations. Anterior cord syndrome. Anterior spinal cord syndrome is the result of the compression of the artery that runs along the front of the spinal cord. Patients with anterior spinal cord syndrome usually have a complete loss of strength below the level of injury. Central cord syndrome. This syndrome is associated with damage to the large nerve fibers that carry information directly from the cerebral cortex to the spinal cord and are particularly important to hand and arm movements. When you sustain an accident-related injury, your main focus is on recovering and getting healthy. A personal injury attorney can deal with the insurance carriers and other parties, and fight for your right to obtain compensation for your damages. Our lawyers at McGarity and Efstration, LLC work diligently to gather your medical records and bills. We interview witnesses, hire an accident reconstructionist when needed and help you locate experienced physicians if you do not have insurance. We have vast experience in mediated settlements and strive to obtain the most money for you that we can. Having an experienced personal injury attorney on your side significantly increases your chance of a fair monetary settlement or judgment. If you or a loved one has suffered a spinal cord injury, contact McGarity and Efstration, LLC at 877.851.4261 or online to schedule your free initial consultation. At our firm, all personal injury cases are handled on a contingency fee basis.